Dai Nippon Printing and Star Micronics will start IoT service utilizing battery-less “Caster Beacon”. Dai Nippon Printing Co., Ltd. (hereafter called “DNP”) and STAR MICRONICS CO., LTD. (hereafter called “Star”) will start IoT (Internet of Things) service for visualization of the location and the flow line of people and objects at commercial facilities like stations and airports, using Caster Beacon that is installed to carriages like shopping carts and that is harvested and activated by wheel rotation. The service will start in April 2017. In the service, IoT platform for location control developed by DNP will visualize and analyze carriage location and flow line at facilities. Caster Beacon (developed by Star), attached to carriages, will transmit Bluetooth signal to a cloud server through receivers installed at facilities. Narita International Airport Corporation (hereafter called “Narita Airport”) has supported proving tests to check service effectiveness at large-scale facilities. Companies that own commercial facilities, transportation infrastructure like stations and airports and indoor facilities of warehouses and plants have a requirement of “Visualization of people / object location and flow line” for improvement of operational efficiency and sales promotion. It is not so easy for them to introduce such system because it requires selection of equipment and a server for information handling, and high workload for operation and maintenance. IoT platform for location control developed by DNP can offer them the visualization service easily in a short time, in combination with Caster Beacon from Star. The platform includes API (Application Programming Interface) for IoT service that will enable companies to start IoT service in a quick manner. 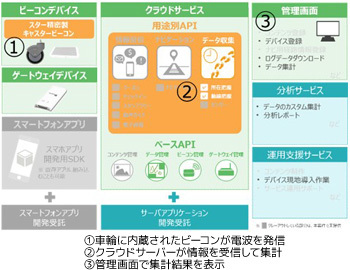 Received data through each equipment will be stored in a server in DNP Kashiwa Data Center*2 with high security function. In addition to “Location and flow line control function”, the platform has “Information delivery function” like indoor navigation and coupon delivery which can introduce consumer service based on location information. Electro-magnetic rotation power generator unit and Beacon circuit are mounted in the caster of carriages and fixtures. There is no battery change necessary because beacon operation will be activated by “Energy harvesting”*3 when the wheel is rotated. With 0.8m carriage movement, it transmits beacon signal equivalent to conventional battery-mounted beacon. Caster Beacon will work just by exchanging casters of general shopping carts and carriages for such casters. Visualization of customer flow line at large-scale facilities like stations and airports will support optimization of shop location layout and advertisement delivery, and also improvement of people jam problem. Average 100 thousands of travelers per day use Narita Airport. In the proving tests, 10 pcs of receivers (gateways) have been receiving data from moving carts and the data are sent to a cloud server. The sever stores and analyzes location information and displays the result on control monitor. Meet the needs of location control of expensive inspection equipment in addition to objects located in various places. Location of neglected shopping carts at large-scale commercial facilities can be detected by smart phones. 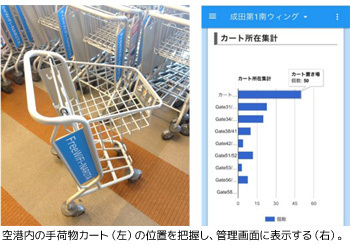 When a certain amount of neglected shopping carts is located out of storage space, alarming will be shown on display and it will improve efficiency of retrieval operation of neglected shopping carts. In indoor space of warehouses and several logistics bases, visualization of carriages utilizing rate and location will optimize operation with right quantity of carriages and investment of additional carriage procurement. It will support prevention of cart neglect, and detection of cart stealing and taking out without notice. In hospitals with many inspection equipment, busy staff can find right inspection equipment and take care actions in a quick way. Location control is required for expensive equipment owned by universities and research institutes from management resource maintenance points of view. *Application development and data analysis report can be optional. DNP and Star will offer the service and related operation (like application development and system operation) to commercial facilities like stations and airports, to companies that operate carriages at indoor facilities like warehouses and plants and to research institutes and hospitals that require location control of expensive equipment. Total cumulative sales target is 1 billion yen by year 2020. *2 DNP Kashiwa Data Center : Offering reliable system operation environment and operation for IT business. *3 Energy harvest : Technology to generate power that is harvested by small energy from surrounding environment .